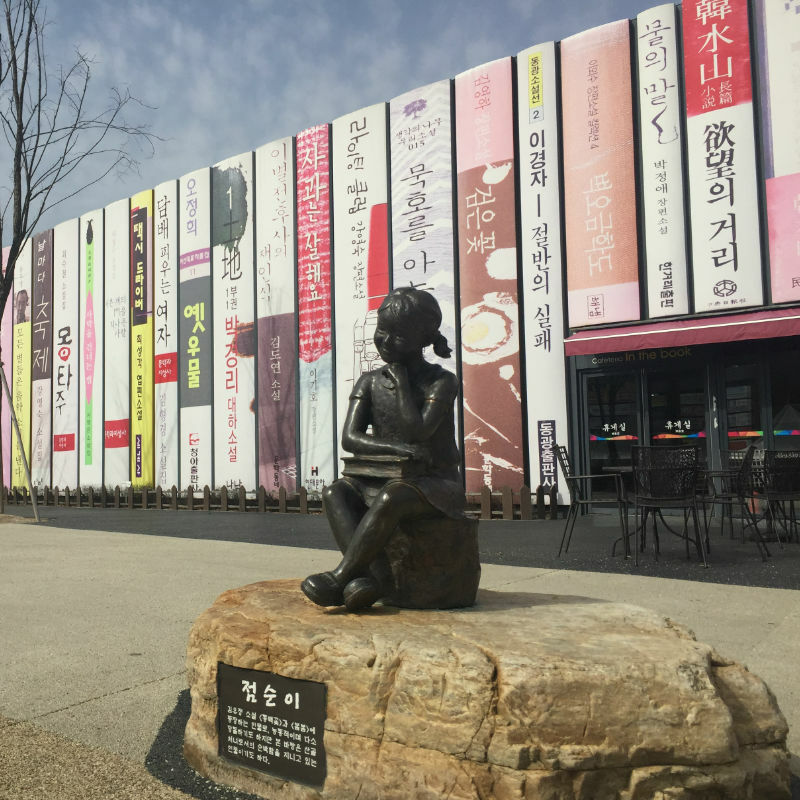 As we have ventured out of Seoul city previously we would like to introduce to 3 more destinations that are definitely worth going to and are quite popular. We will discuss in more depth and give some personal insights on the places! OPTION 1: Gapyeong Tourism Attraction Circulation Bus. Looking for places out of Seoul? 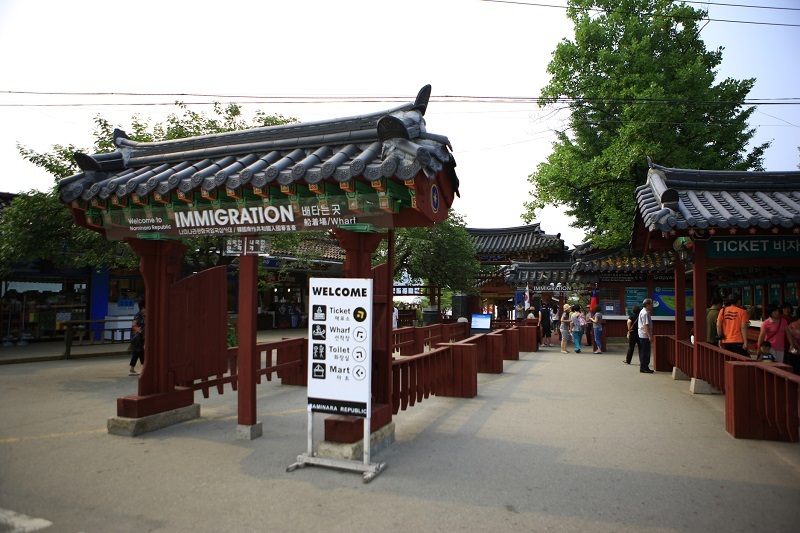 How about taking a day trip to Nami Island, Petite France, and Garden of Morning Calm? 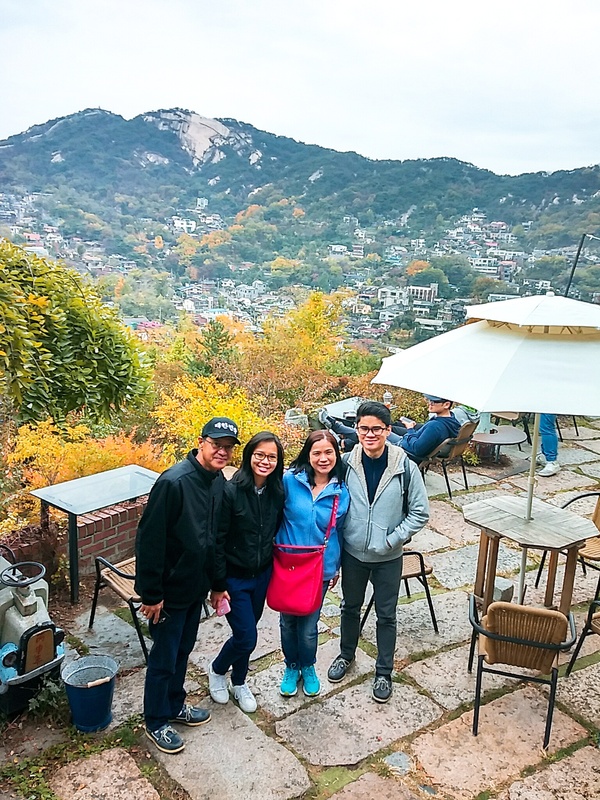 This tour package covers the transportation and admission tickets to 3 of the most popular destinations outside of Seoul! 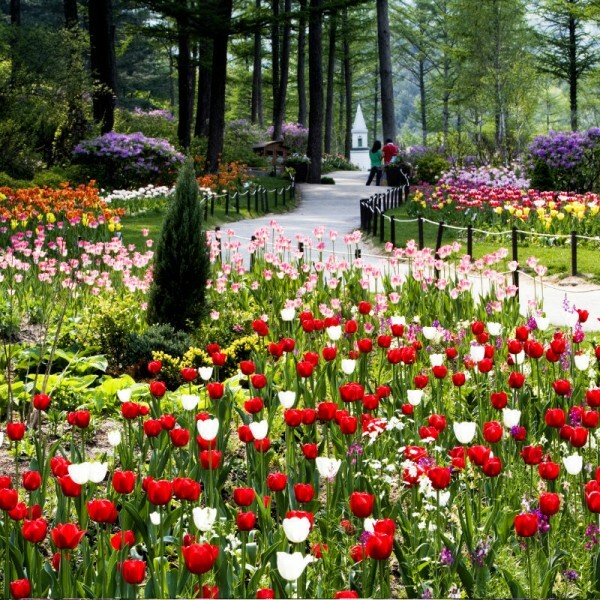 Come enjoy the beautiful nature of Korea with us! Your private car will give you more flexibility on time and places you want to visit and pick up/drop off right from the doorsteps of your accomodation! 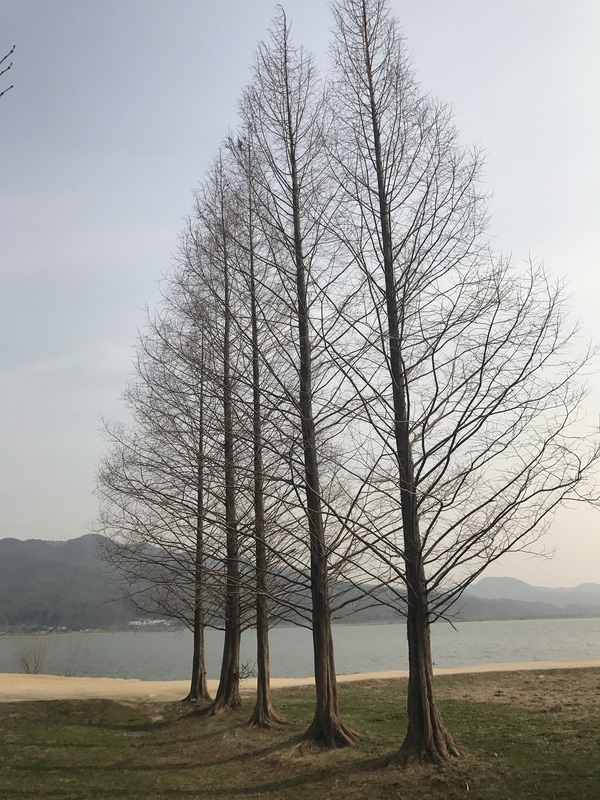 Nami Island is 63 km away from Seoul in the direction of Chuncheon, and is famous for its beautiful tree lined roads It takes 1.5 hours away from Seoul by car. Since it is not far from Seoul, many couples and families come to visit. Namiseom Zip Wire is an eco-friendly leisure facility established by Gapyeong County Office in partnership with Gyeonggi Tourism Organization and Namiseom Inc. It is one of the biggest zipline in Asia. Riders start from an 80 meter-high tower and zoom down along a wire cable to Jaraseom (640m away) and Namiseom / Nami Island (940m away). It is the grave of General Nami, who led a great victory against the rebels in the 13th year of the 7th king of the Joseon Dynasty, King Sejo (reign 1455-1468). In addition, it has invented its own passport, currency, stamp and telephone card, and has promoted the establishment of Naminara in other countries. 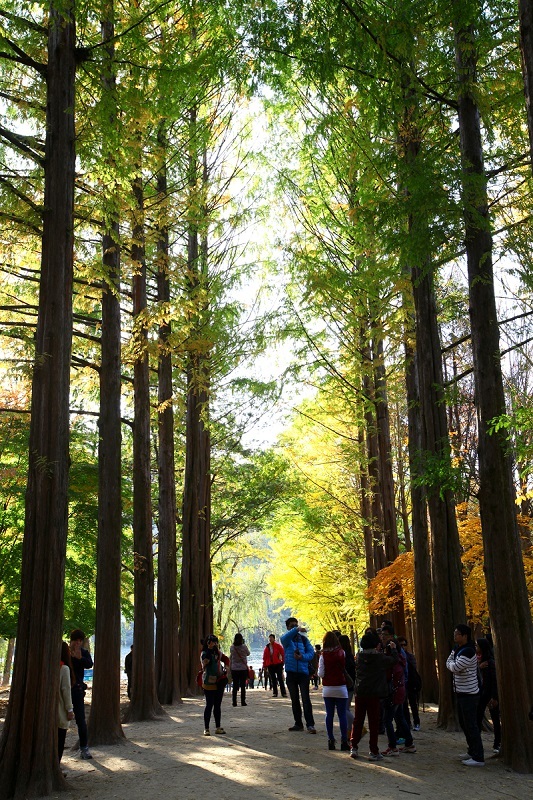 Every tourist going to Nami Island takes a photo with the majestic redwood trees lining both sides of Metasequoia Road and Central Korean Pine Tree Lane. This was the backdrop for many romantic scenes in Winter Sonata. The Forest Village and Bungalow Row Riverside Path are really quiet and relaxing, and, in our opinion, the best areas on the island. 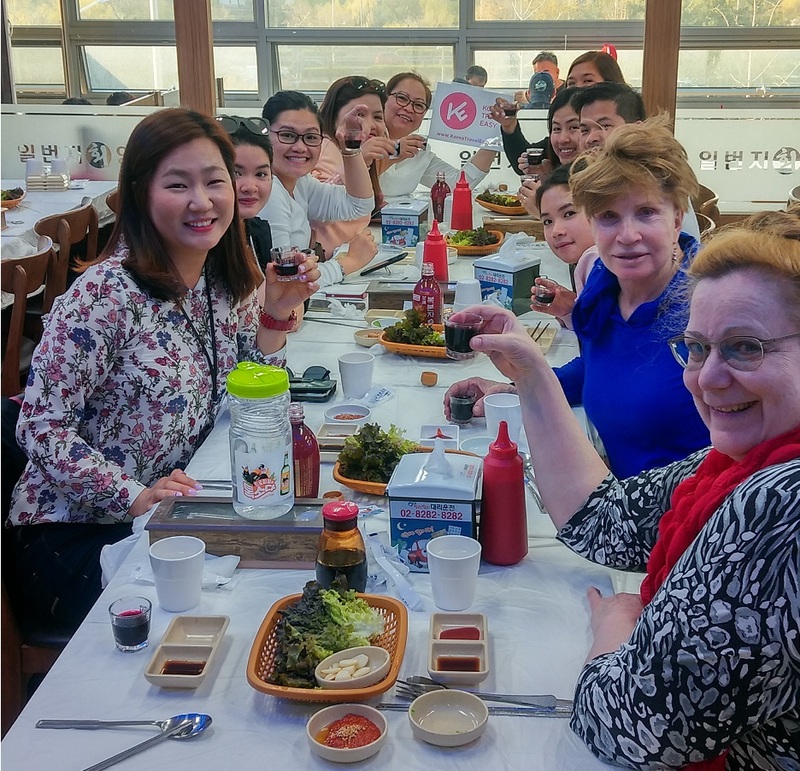 If you are coming to Nami Island during meal hours, recommend that you can eat before entering the island where is there better restaurants for better value and taste! The garden was designed to be an artistic space with scenic walkways, beautifully manicured grass, and flower beds that connect the garden’s 20 different themed sections. The Garden of Morning Calm is a botanical garden with a variety of themed gardens set in the low foothills of a mountain. Be amazed by the Hometown Garden with its countryside villa appearance, the Korean Themed Garden offering up a feeling of entering a traditional painting, the Western-style J’s Cottage Garden and the other 20-plus themed gardens. 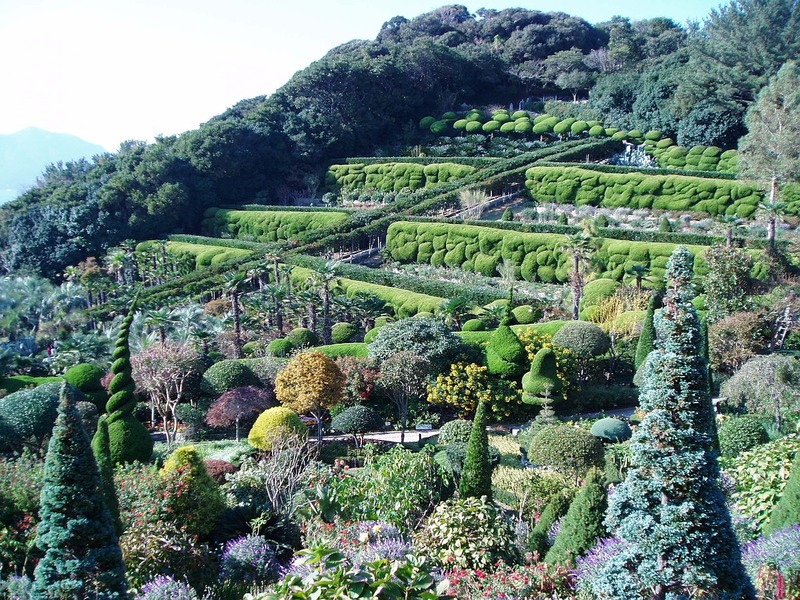 At the Garden of Morning Calm, you can find about 5,000 kinds of plants and species of flowers. There are many different festivals during the year including Spring Garden Festival, Festival of Roses and Hydrangeas, Festival of Chrysanthemums and Autumnal Tints and the Lighting festival in the winter. 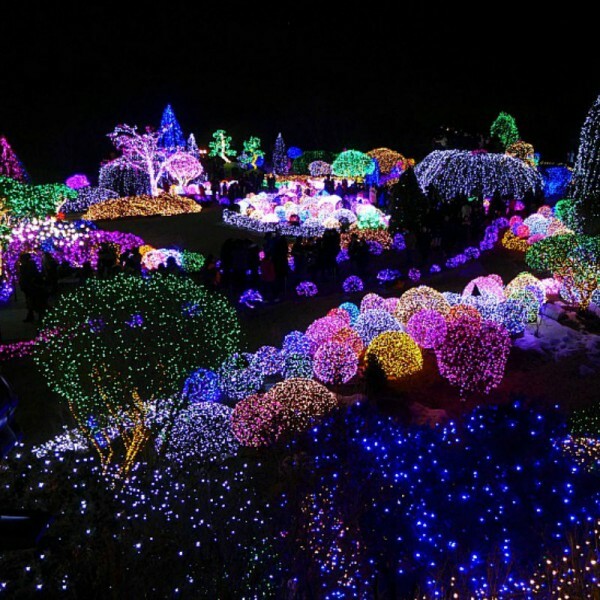 the Lighting Garden Festival has been held and it’s only available in winter from early December to mid-march. It might not amaze you when the sky is not dark, but when night came, all the colours of the lights make you feel you’re in a magical world! 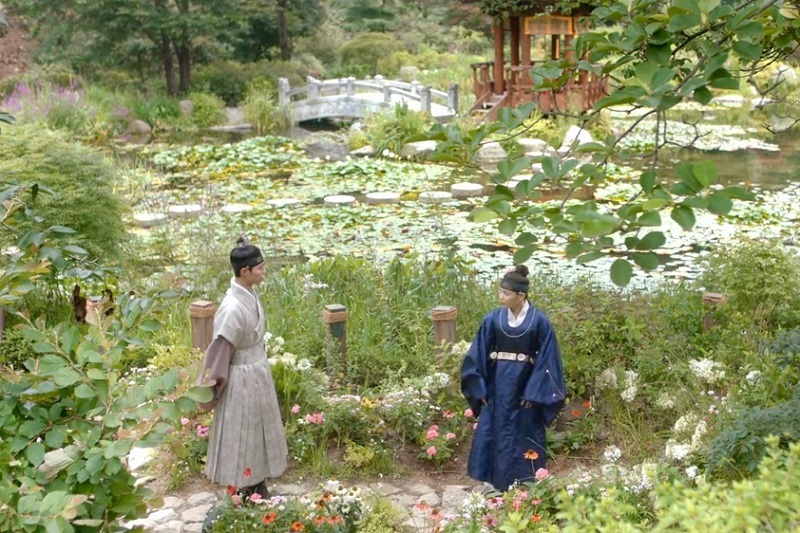 In the first episode, Princess Myeong-eun (played by Jung Hye-sung) is seen here waiting for a letter from her love, and in the third episode, Ra-on encounters the Crown Prince while she is watching over Princess Yeong-eun. The Garden’s is different for each season as you can see flowers in Spring/summer. fall leaves in Autumn and the lighting display in the winter so every season looks different ! 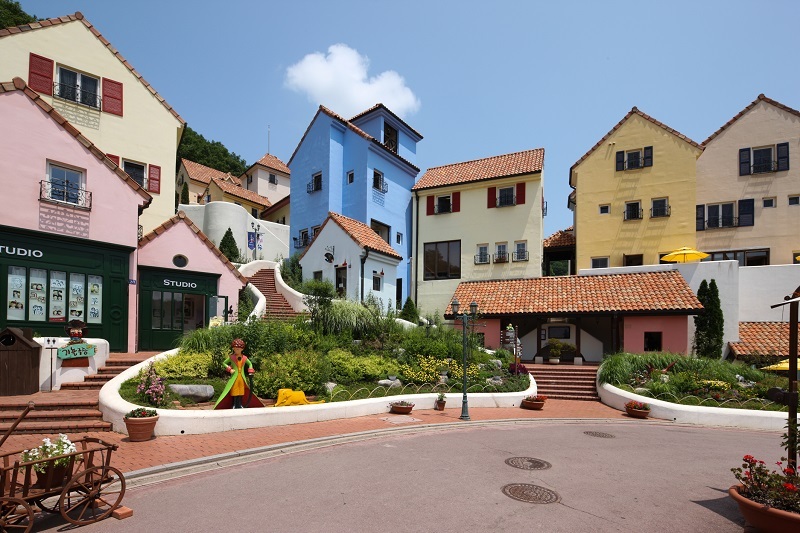 After Nami we will head to Petite France, a cutesy, colorful little French cultural village in the Korean countryside. Petite France was built with the concept of a French cultural village that consists of buildings related with the famous French novel “Le Petit Prince” (the Little Prince) by Antoine de Saint-Exupéry . Why is it special and famous? 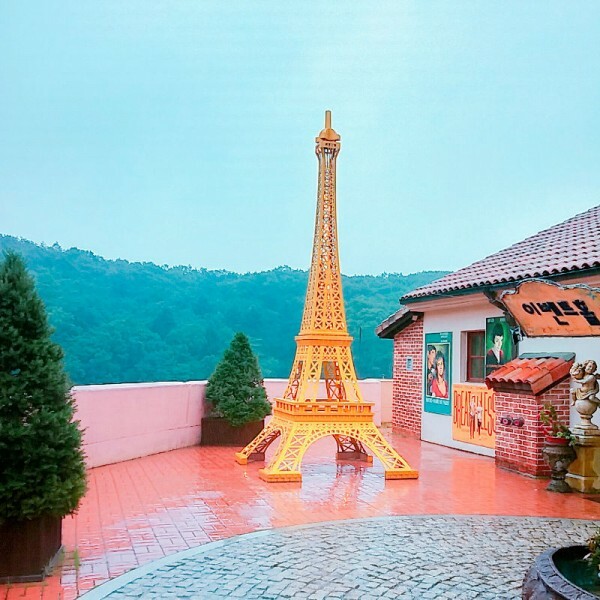 Petite France was also a filming location of many popular Korean dramas and variety shows such as Secret Garden, My Love from the stars and Running Man. The village has shops, cafés, restaurants where you can feel like you are in France. 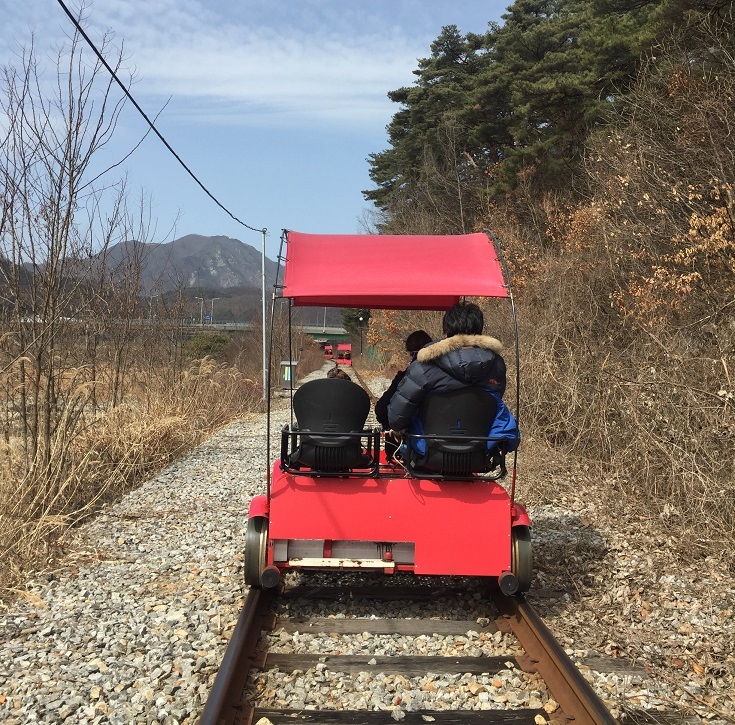 DAY TRIP NEAR SEOUL in SPRING – STRAWBERRIES, RAIL BIKE, K-drama shooting location and more! 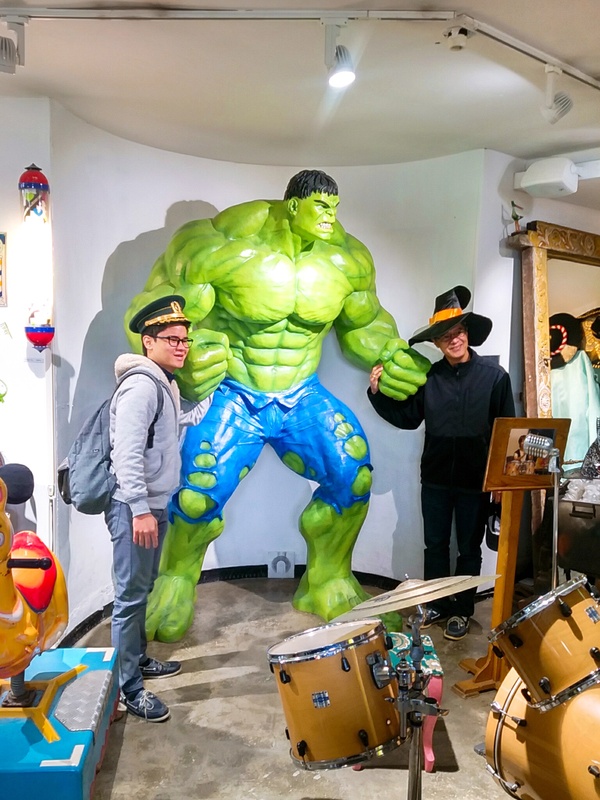 We want to bring you out of the Seoul city and visit around one and a half hour from Seoul. 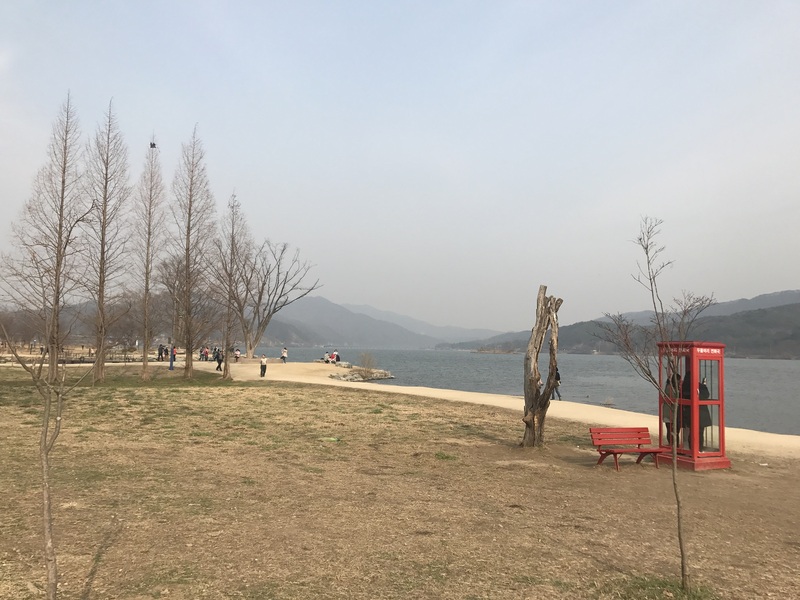 Many of you might know already about Nami Island and Petite France. We will recommend you to other places to go! You can go by car it’s the easiest to visit few places in a day. Otherwise , it might be difficult to go from one place to another. Let us see what are great things to do this season! When to pick: every year from December to June. Korean strawberries are known to be really sweet and famous and let’s find out the reason ! Why winter strawberries ? 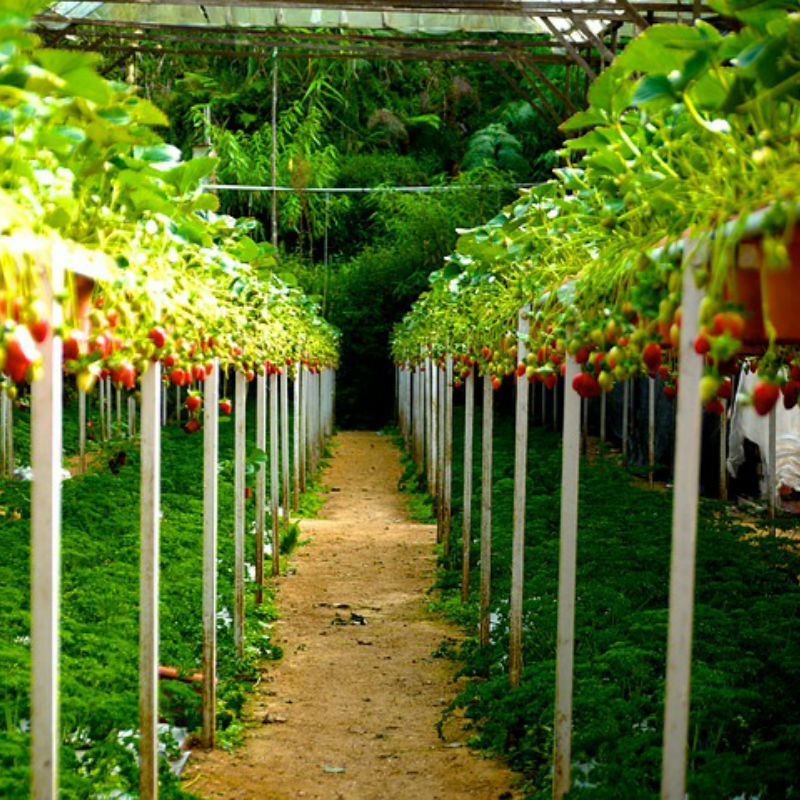 in Korea the strawberries are grown in greenhouses because until 1980s strawberries season was in early June. 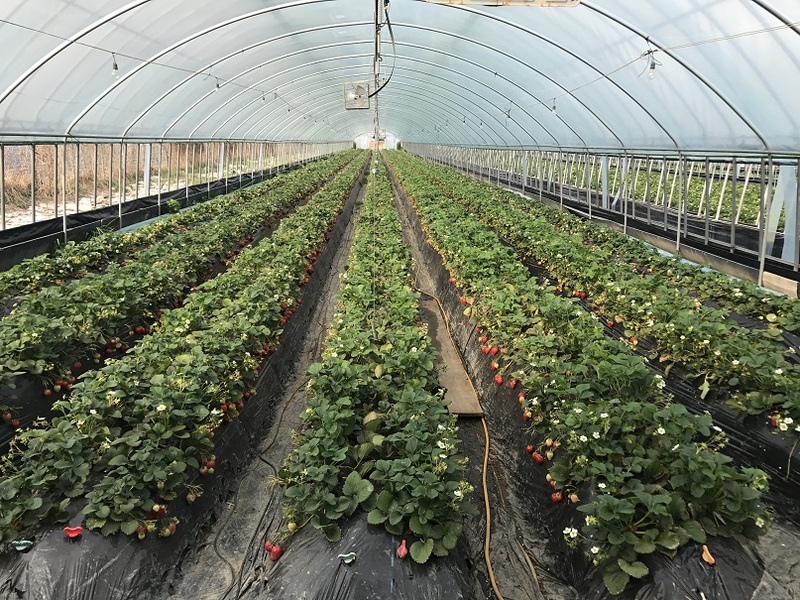 but then greenhouses spreaded and they started to grow in the winter because the weather is colder it takes longer for strawberries to grow and to ripe. 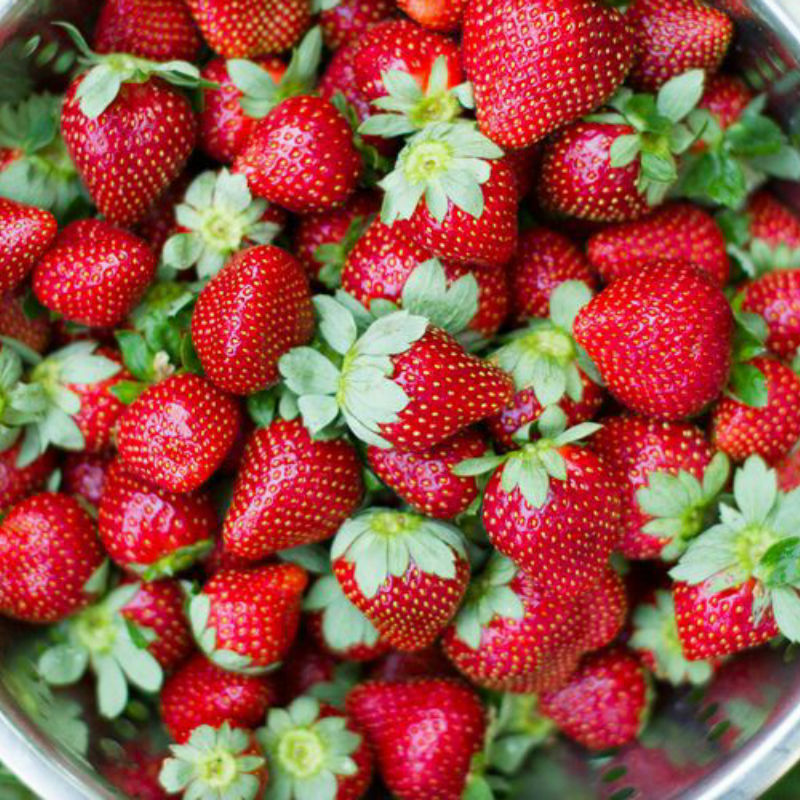 This makes strawberries sweeter, and less sour. That’s why Korean strawberries are known to be sweet and good quality! 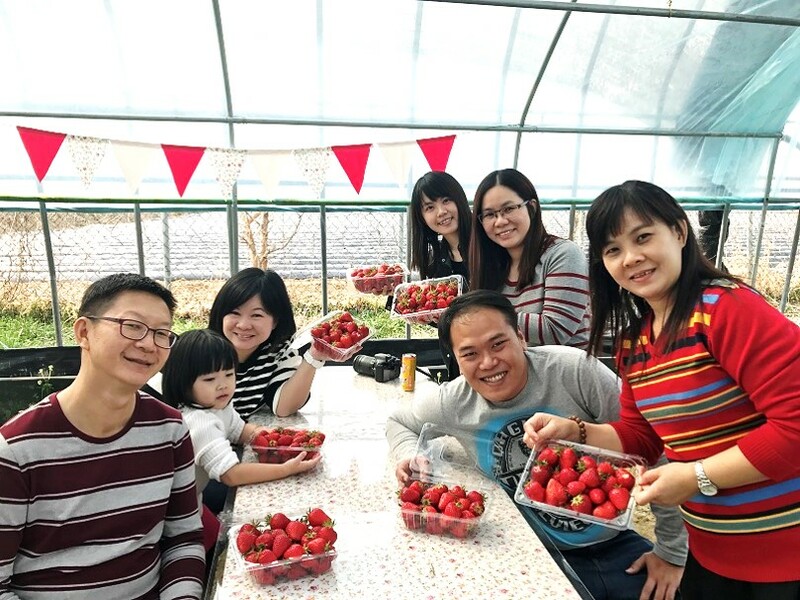 What else to do at a strawberry farm ? 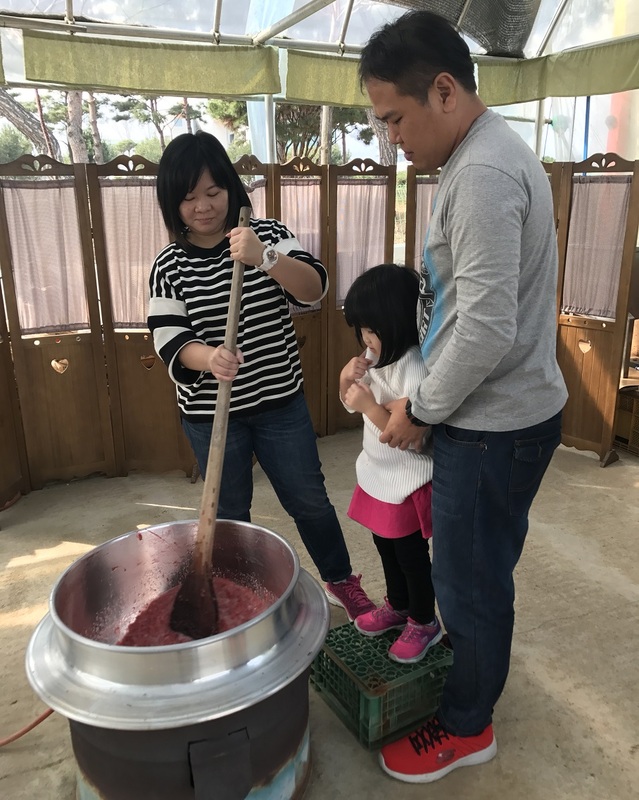 Making Jam: Why jam at strawberry farm is more special? The jam freshly made at the farm has a higher percentage of strawberries (usually it’s only 1:1 proportion sugar and strawberry) at the strawberry farm it’s their special recipe choosing the sweet strawberries and with 50 % less sugar and more strawberries so there is strawberry taste. For example, for 1KG strawberries, they put 500g of sugar. 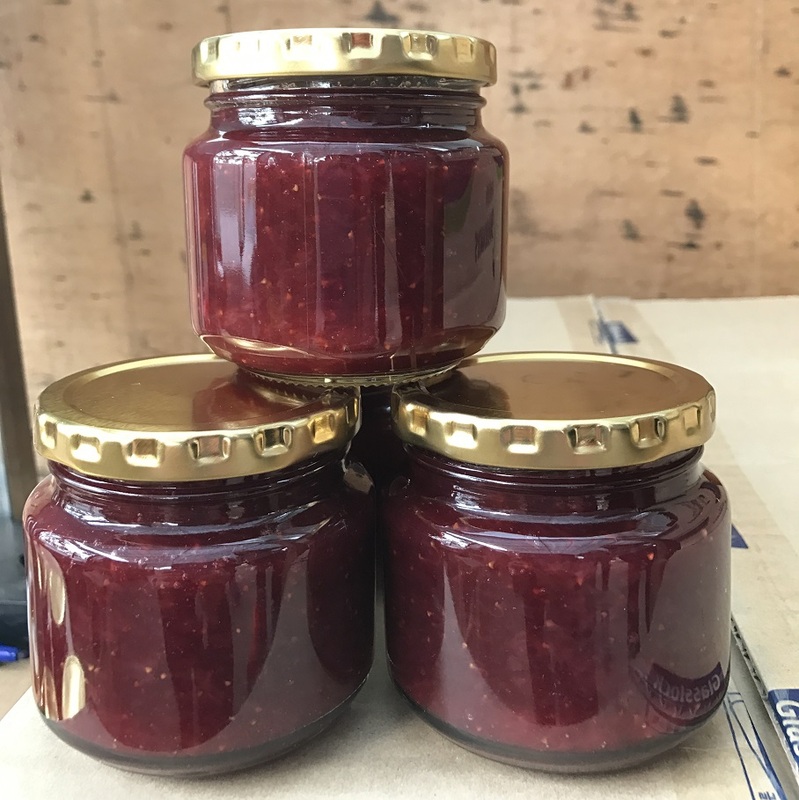 How to make it: put the mentioned proportions of fresh strawberries and sugar into the special big pot and continue to stir for 20 minutes and then package it into jars. It’s a really big pot and the stirring stick is really big! This is a song in Korea called “DALGI” strawberries and quite famous! Check it out! 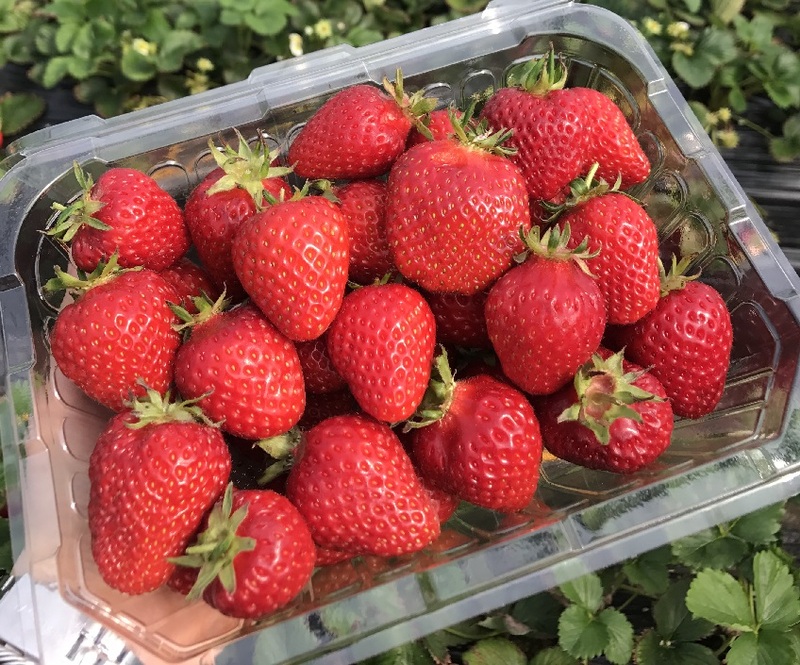 What is the cost of picking strawberries? First, you need to book the date and time when you will do strawberry picking. This is to ensure that they do have enough strawberries ready for picking. It’s on average around USD$20 for 500g of strawberries to pick and make jam and you can bring back. Don’t eat them inside the strawberry farm as it is not clean inside, the owner should be washing some for you to eat after you pick! Introduction and what is special? Dumulmeori literally means ‘two water area,’ and refers to the place where Bukhangang River and Namhangang River meet. The dock for an ancient-style ferry and weeping willows add to the rustic beauty of this area. Another attraction at this site is the three 400-year-old Zelkova trees that appear as one giant tree. In drama, it was featured in SHE WAS PRETTY with Hwang Jung Eum and Park Seo Jun in 2015. This is where they confessed their love for each other. 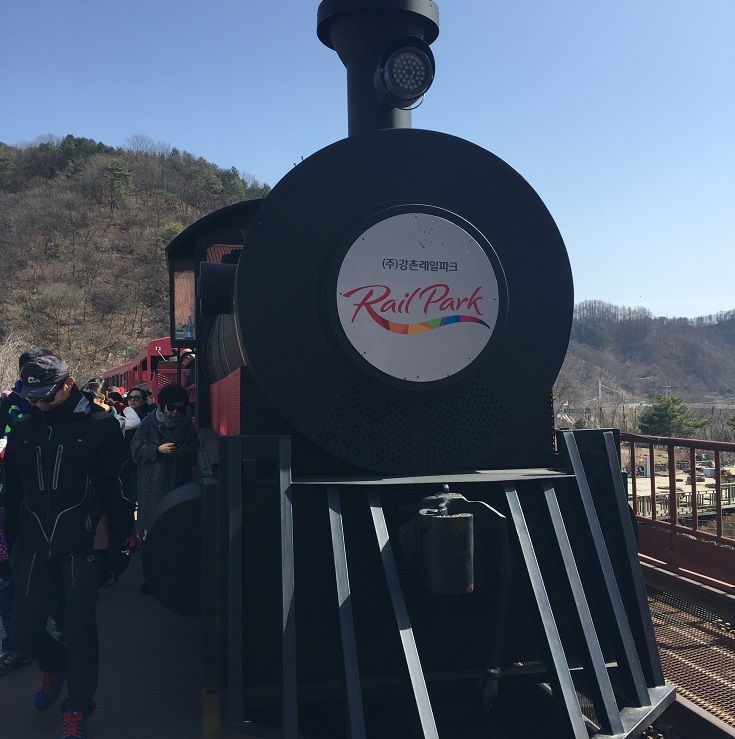 When the Gyeongchun Line, a double-tracked railway line connecting Seoul and Chuncheon, it replaced the Mugunghwa train that traveled this route for 70 years. 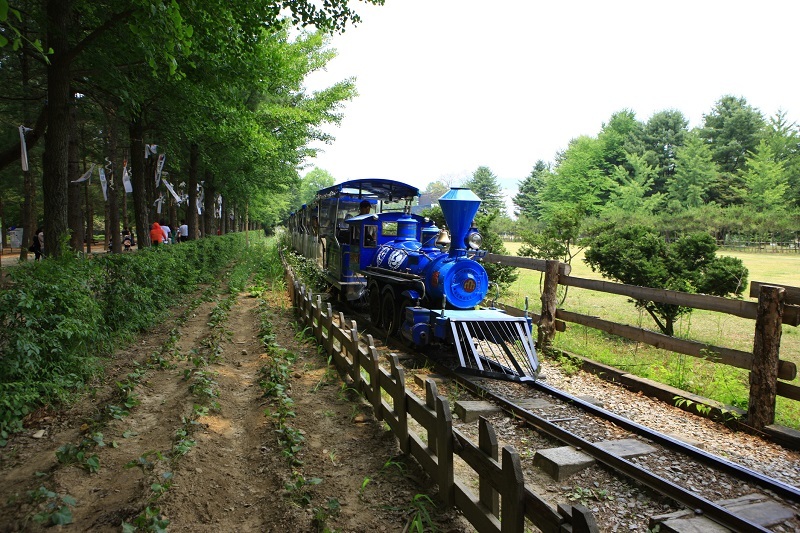 Built on the discontinued train line, Gangchon Rail Park is a popular tourist attraction where visitors can pedal along old railroad tracks while taking in the lovely Bukhangang River scenery. You will see the nice setting of the station (different from other stations) with the books that he wrote in the background! Very interesting! 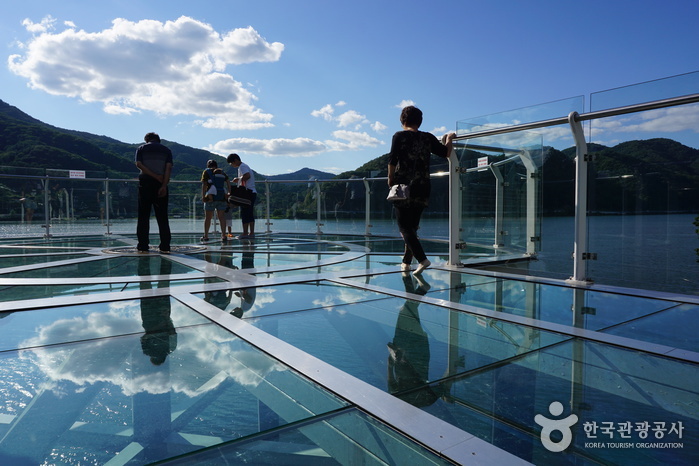 Skywalk has gained attention as a new tourist attraction in uiamho lake of Chuncheon. Located in the middle point of the bike paths and scenic observation deck, the sky walk is a great place for taking pictures. Skywalk is a round shaped deck soared about 12 meters in height from the surface of the water. It also has a transparent floor and hand railings, which makes a thrilling experience as you will feel like you are walking on the sky while having the feeling of falling into water! Korea may have an image of being a foodie and shopaholic heaven but Korea is not all about shopping and eating. 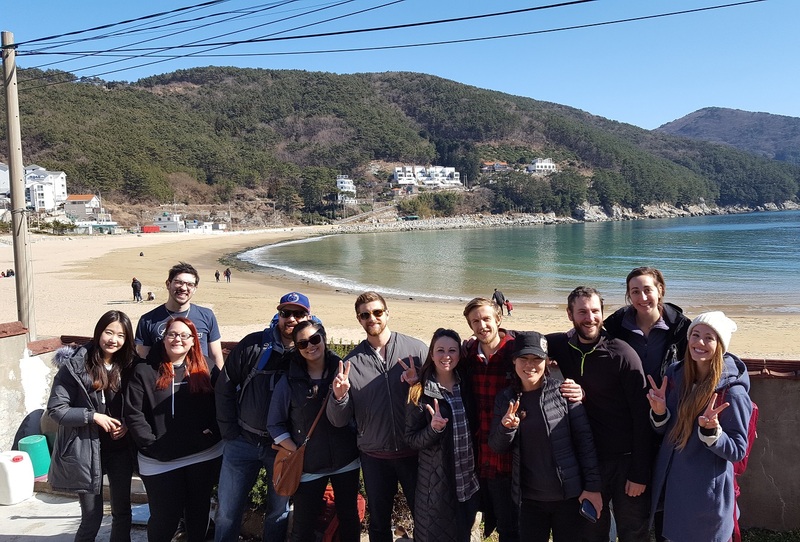 Korea is on a peninsula meaning there are 3 sides surrounded by water: lots of stunning ocean side and beaches and the weather is great in the spring and summer for some outdoor activities! Winter is almost over now and we want to introduce you to a great place to go in Spring when you are in Korea. 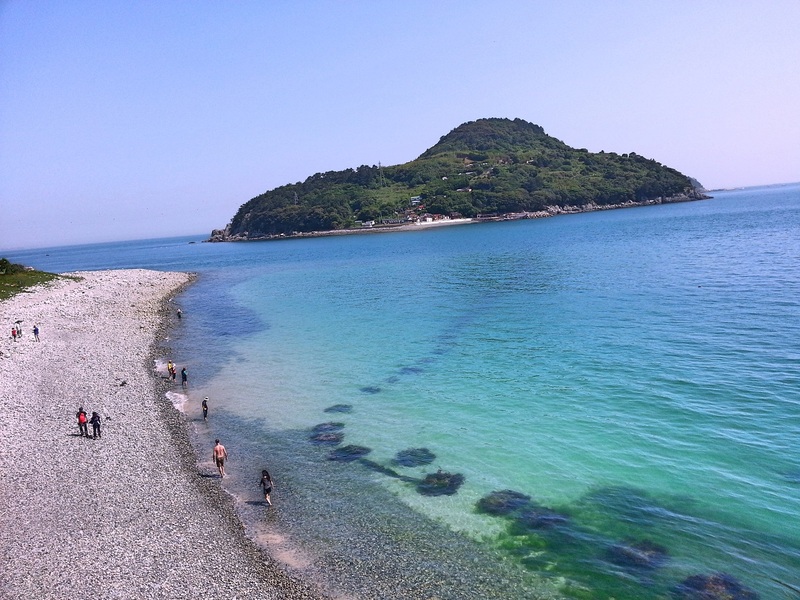 In the south of Korea, there are amazing beaches on Geojedo (Geoje Island) in the south side of Gyeongsangnam-do province. 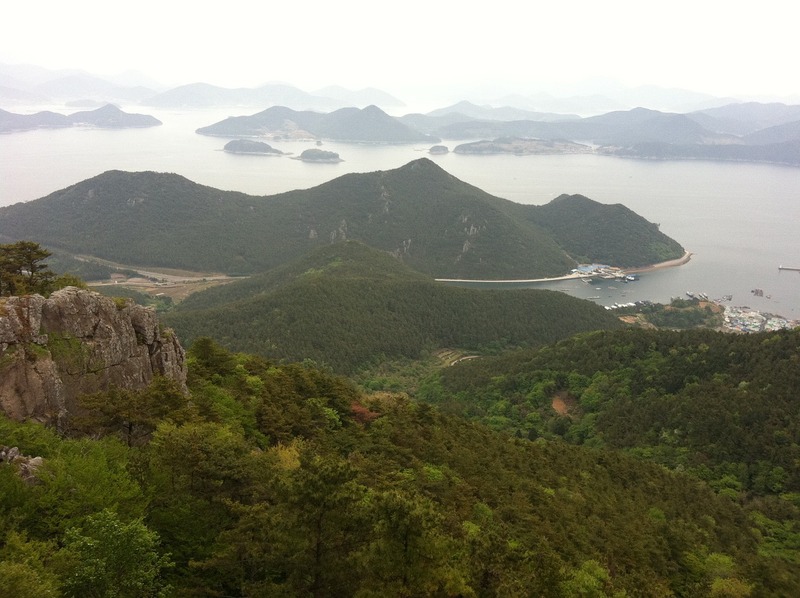 Geoje Island is the second largest island in South Korea, right after Jeju Island. 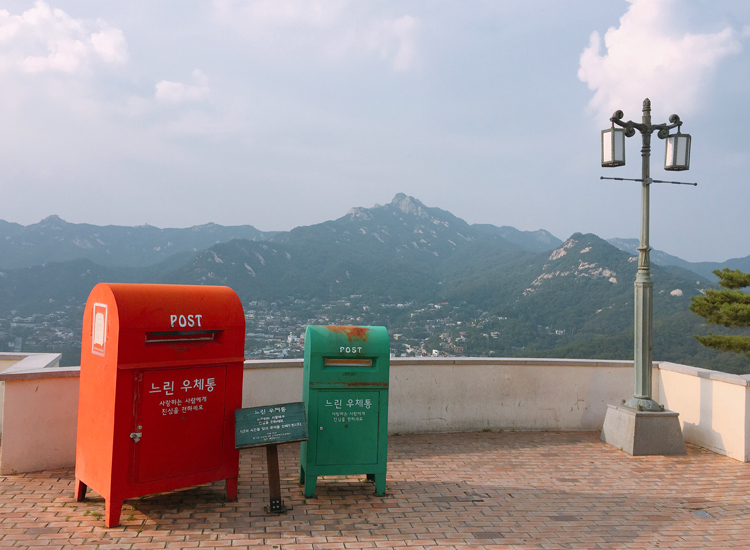 Geojedo is located near Busan, making it easily reachable, by public transport. 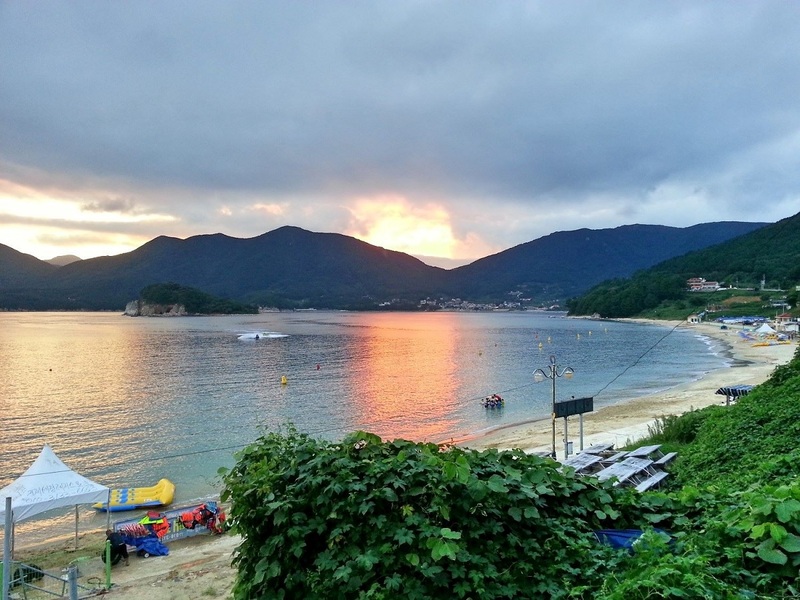 Geojedo is also home to some of the most popular places to visit in the South Sea, namely Haegeumgang, Hakdong Mongdol Beach and Oedo Paradise Island. Oedo has become a very popular spot due to the more than 3 000 decorated trees, along with the Mediterranean style buildings which reside on the island. 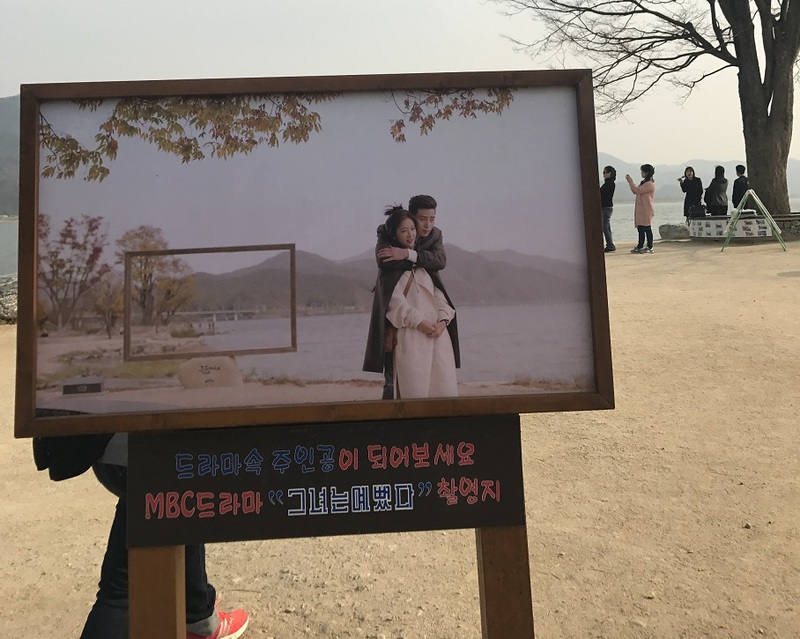 The island has also become a popular filming destination for Korean dramas, because of the exotic atmosphere and clear sea the island has. Spring comes down south early and average temperatures are also much warmer with maximum temperatures ranging between around 14 to 20 degrees Celsius during the spring. 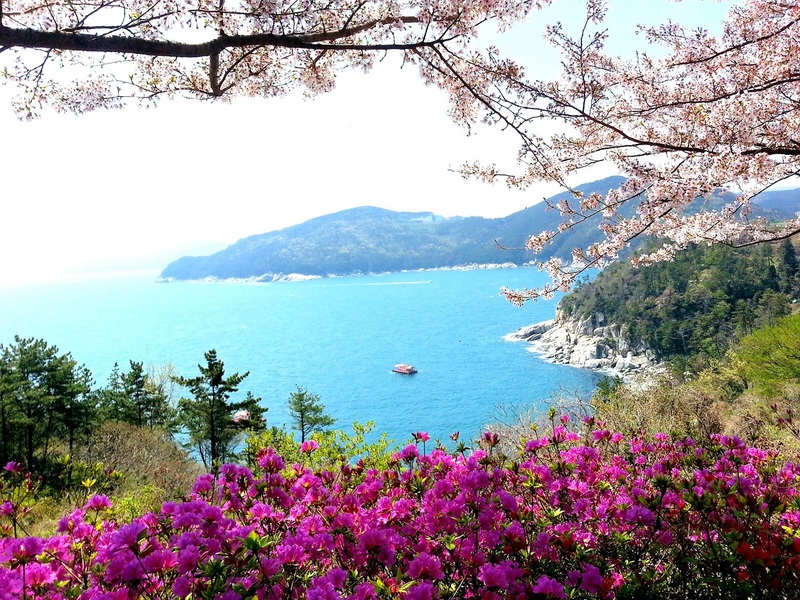 It is a beautiful this time of year with a multitude of Korean cherry blossoms, daffodils, tulips, camellia and other flowers adoring the breathtaking coastlines and multitude of islands. It is definitely a must go for those who want to experience the natural sceneries in Korea! 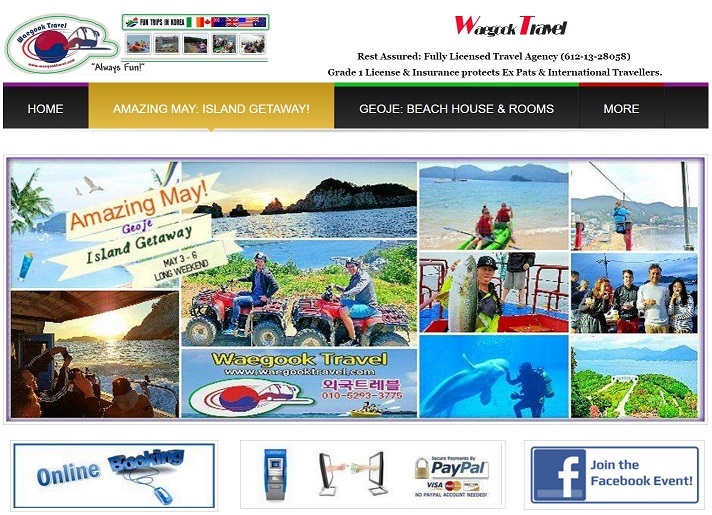 Our partner Waegook travel is an expert in this field and they manage a few guest houses on Geoje Island and have been organizing special tours since 2005. They offer you the best prices and highest quality travel services. Imagine a great weekend with the highlights below. 3 nights Wahyeon beachfront accommodations in shared guest houses that fit 5-12people. There are also private room options. Take part in exciting adventure activities like sea kayaking around an island, ride your ATV through a lush forest with spectacular sea-views, spend an amazing time at Sea World and or the Maritime and Fishing Folklore Museums, hike to Gonggoji now in full glory, view an array of islands and famous landmarks through binoculars or your camera lens at Wahyeon Observatory, go back in time at the bamboo forest and fortress at Gujora, visit one of Korea’s top attractions Oedo Botanical Island and much more! KoreaTravelEasy’s recommendation is the sunset cruise. Those of who have been say it is an experience of a lifetime. Experience the beauty of the sunset over unique cliff formations. If you inquire now and book through KoreaTravelEasy, you will get the Third Night FREE when you book 2 nights consecutively! For example, you can book Friday/Saturday and get Sunday free! B. Tour Discounts: Get KRW 10 000 off the current price at time of booking. Remember to Book through KoreaTravelEasy and there are many more EXCLUSIVE discounts from breakfast to tour discounts! 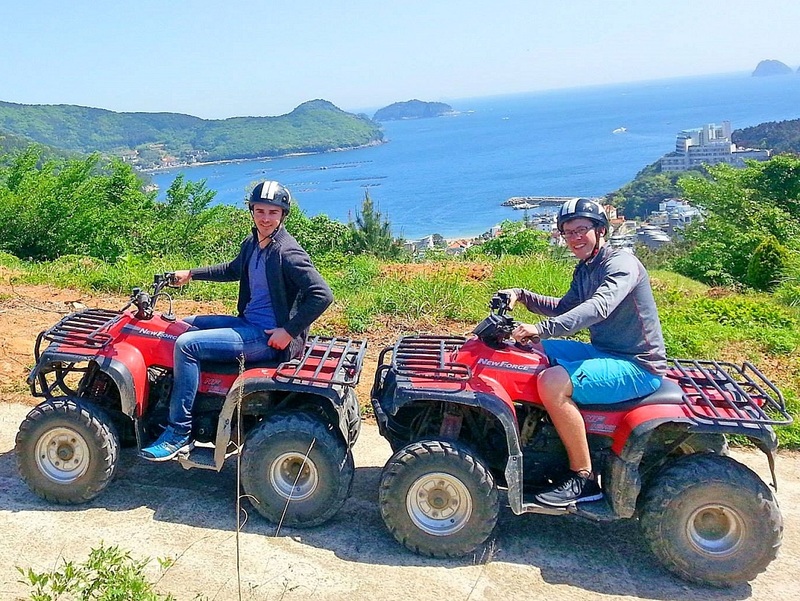 ASK US ABOUT GEOJE ISLAND TOURS to us now! Bukak Skyway is the road name, it’s a two-lane road with an 8 km length from Jaha-moon to Jung-ryeon Arirang Pass along the ridge of Bukak mountain in Seoul, around 20 minutes from City Hall . We recommend to take a taxi and we also recommend and also go see the lesser known Bukak Skyway Pavilion. It is famous for night view and sunset, today we introduce to go there in the afternoon but you can go daytime and take a walk or hiking to see many trees in the mountain. There are a few stores and you can can relax and take a rest (store, cafe, restaurant ) . From there you can see the N Seoul tower and Seoul city view, Bukak Mountain and Inwang mountain. WHAT ELSE TO SEE THERE? Coffee prince is a famous Korean drama that was widely known in 2007, starred Gong yu and Yun eun hye . The café set up in the mansion that was the drama home to Lee Sun Kyun, Gong Yoo’s composer cousin. The café, which also offers a very nice view on the cafe terrace. After the sightseeing with the great view at Bugak Skyway and visiting the galleries. Aren’t we a little hungry ? let’s head to have some seafood! It is quite an experience to visit Noryangjin Fish Market ! Noryangjin fish market is the largest and most popular seafood market in Seoul. As it’s connected to the subway station, you can easily reach the fish market within the city. Compared to other local markets, you can get fish and other kinds of seafood that are fresher at Noryangjin Fish Market at lower prices. 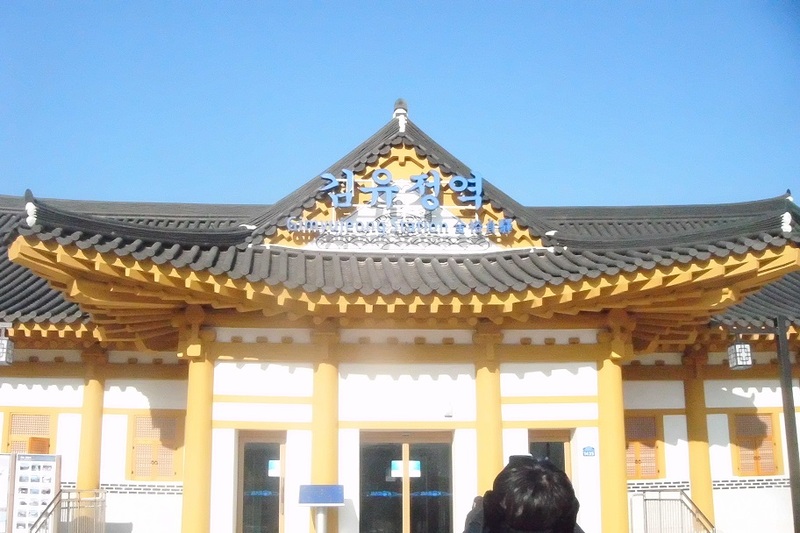 This is because Noryangjin Fish Market is both a wholesale outlet as well as a retail market. Noryangjin is close to the Han river so you can when you arrive you will already smell the freshness of the natural water! Noryangjin Fish Market is a 24/7 fish and seafood market but the retail shops mostly close around 9~10pm. If you come in the very early morning around 1~5am, you might be able to see the the fish auctions in the morning. 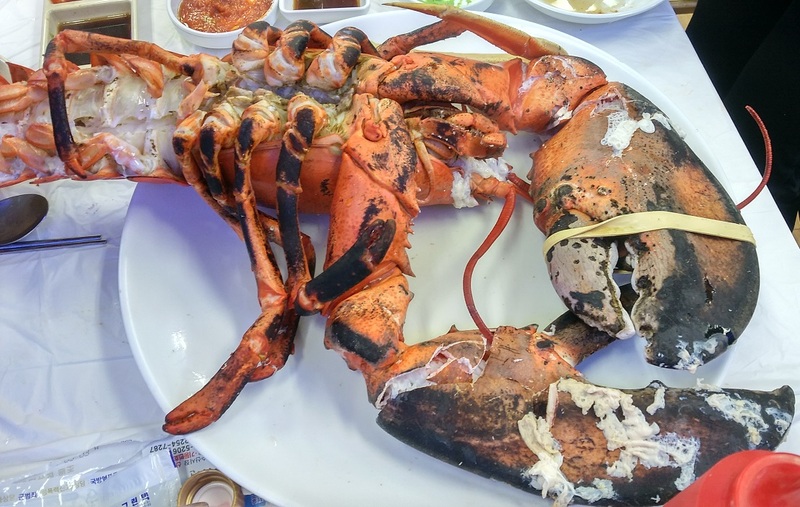 but most likely the seafood eating is more interesting and you can still see a display of all kinds of interesting seafood at good prices for your lunch or dinner! In the fish market you will be overwhelmed with SEAFOOD AND FISH! you will see many many stalls and vendors! it’s quite a sight! The market gets quite crowded in the evenings with the dinner crowd craving for seafood and drinks. We suggest going to the market around 5:30PM -6PM before all the dinner crowd! you can have a seafood dinner there after exploring the market. be prepared of the “fishy” smell – after all there is a lot of fish and seafood there ! From exits, you will know that you are near the Noryangjin Fish Market because you are close to the fish market and you will smell the water and seafood! 2) WHAT TO DO AT NORYANGJIN ? BUY SEAFOOD! 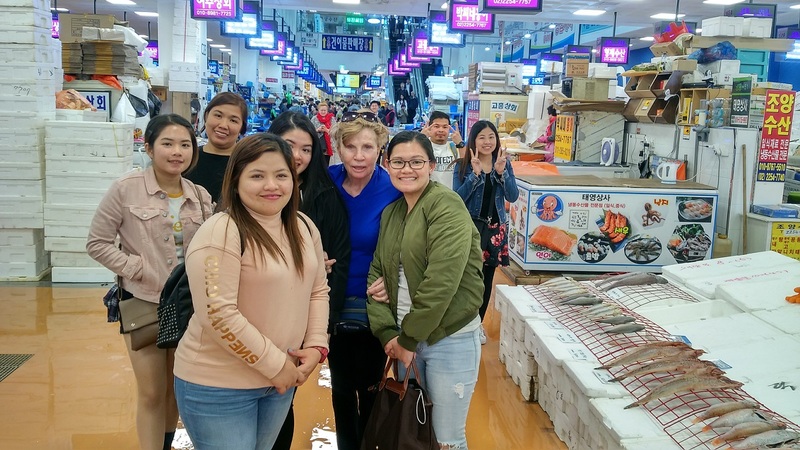 You might be thinking “why should i buy seafood here at Noryangjin Fish Market – I don’t know how to cook or I don’t have the place to cook it back at the hotel” – NO WORRIES! all stalls here at Noryangjin Fish Market partner with the restaurants at the floors above, so after you buy the fish you will eat at a restaurant who will prepare your seafood ! What they are selling and what can buy? Don’t bargain right away and wait to agree to a price! Visit 2-3 places and ask for the price and see which stall sells fresher and better deal seafood . They also charge for 1 kg so compare the price that way might be easier! Most of the sellers are not good at English but some might speak a little English or Chinese , otherwise you might need to use body language to talk with them. 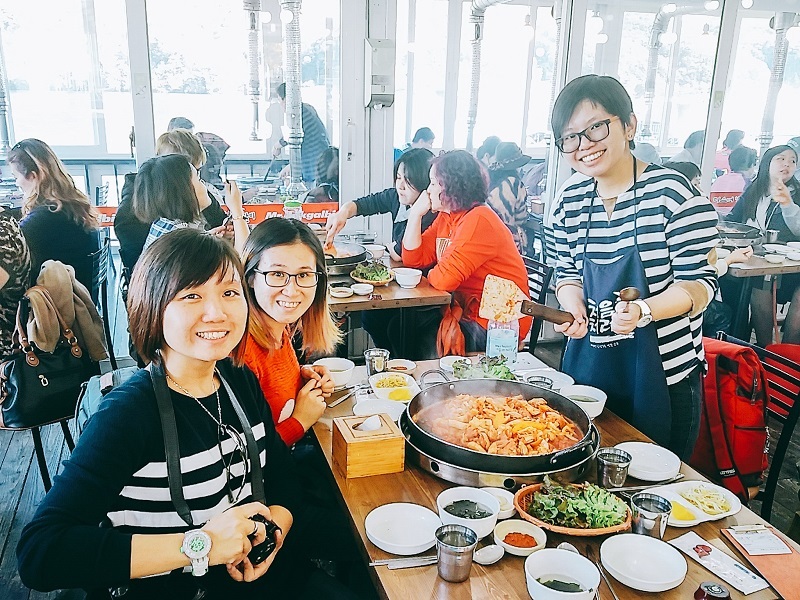 We recommend you go there with Korean friends or a tour guide by KoreaTravelEasy! Once you get a sense of the rough pricing, then pick a stall you are comfortable dealing with. Most vendors will agree with you taking pictures of their fishes, abalone, squids, prawns – just please don’t touch the seafood! You can select and decide to buy the fish and other seafood at the fish market – the stall owner will choose for you and package the fresh seafood ready for cooking. Then a runner from the partner restaurant will take the seafood you bought and guide you to the restaurant where you pay to have it cooked in whatever way you prefer (steamed, fried, fried etc.). → WHAT SEAFOOD TO EAT THERE? what is popular? 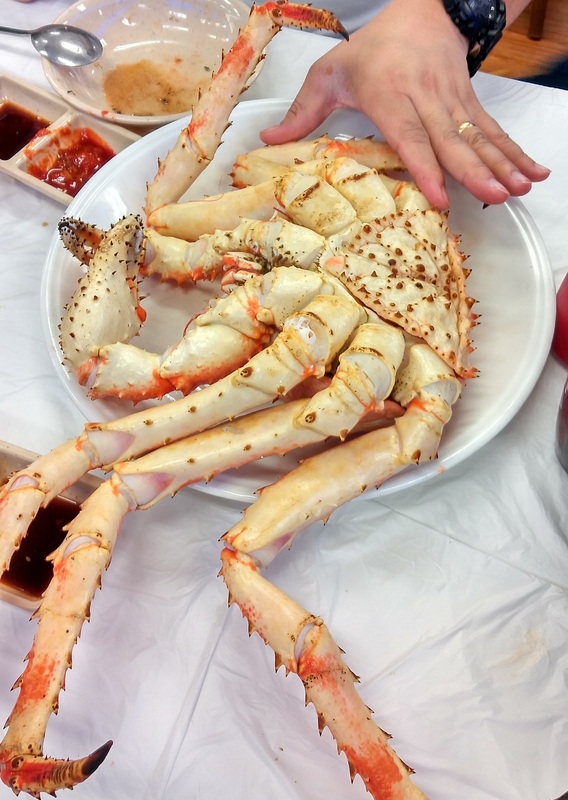 King crab, Flower crab, Clams, Abalone, Oysters ? Prawns ? you are bad at bargaining or don’t know the market price of seafood, then don’t recommend that you buy at the first hawker you see as you might get charged more. Compare the prices of a few stalls first before reaching a decision. After buying your fish or seafood on the ground floor, the vendor will bring you to the partner restaurant, where they will prepare your fresh seafood into yummy food! There are some cooking fees even though you bought seafood, so you better check price table before enter. You may need help from Korean! The Bridge is one of the bridges that connect the north and south of the Han river and there is a rainbow fountain installed along both sides of the bridge and rainbow colored water will spray out into the river showing a beautiful show of water, music and lights. Banpo Bridge Rainbow Fountain operates every day from April to October, in the day time and also nighttime for 20 minutes each time. To see the best view it’s to go at night! How to get there: Subway station closest is 15 mins walk from Express Bus Terminal but by car is the best as can go the closest without any walking. The floating islands located near the southern end of Banpo Bridge. The word ‘Some Sevit’ contains the meaning of ‘awesome’ in recognition of the wonderful space that awaits visitors there. It is used as a performance venue, conference and exhibitions. Han river TIP → If you are still hungry you can order Korean fried chicken from Hangang River! That’s an activity Koreans love to do ! Let KoreaTravelEasy help you plan your trip! Today we will introduce a great place to go in spring in Seoul. We want to highlight calm and peaceful places where nature and history come together amongst the modern buildings in the middle of the city. After the long and cold winter months, we are all expecting to see the spring to come with birds chirping and flowers blossoming Korea is geographically situated in a temperate climate zone at medium latitude. As a result, it has four distinct seasons. In general, spring is from March to May. Spring in Korea is from March onwards till May with flowers blooming. Many of you must have heard about the Gyeongbokgung Palace (Royal Imperial Palace) but what about the Deoksugung area? 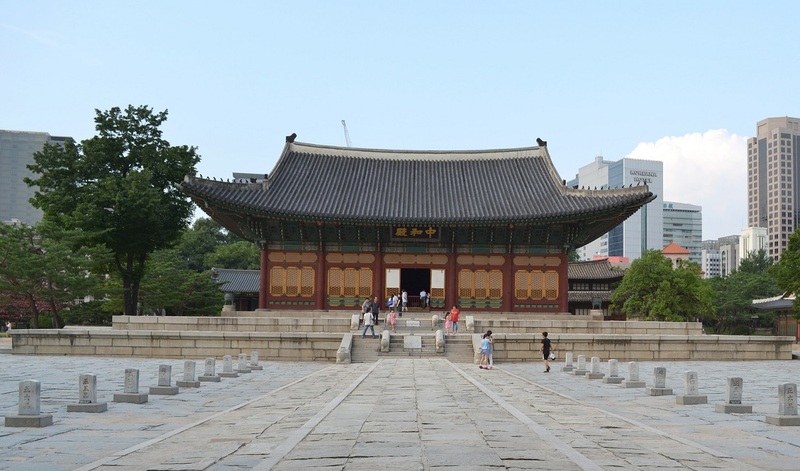 We recommend the Deoksugung Palace as Gyeongbokgung is the main palace and might be crowded at times. However, Deoksugung is a bit less popular but doesn’t mean it’s not nice! it is conveniently located in the very center of Seoul, just right in City Hall and is a mix of Korea and western Korean flavors. Also around the area there are also other activities. so let’s start the day from the morning! 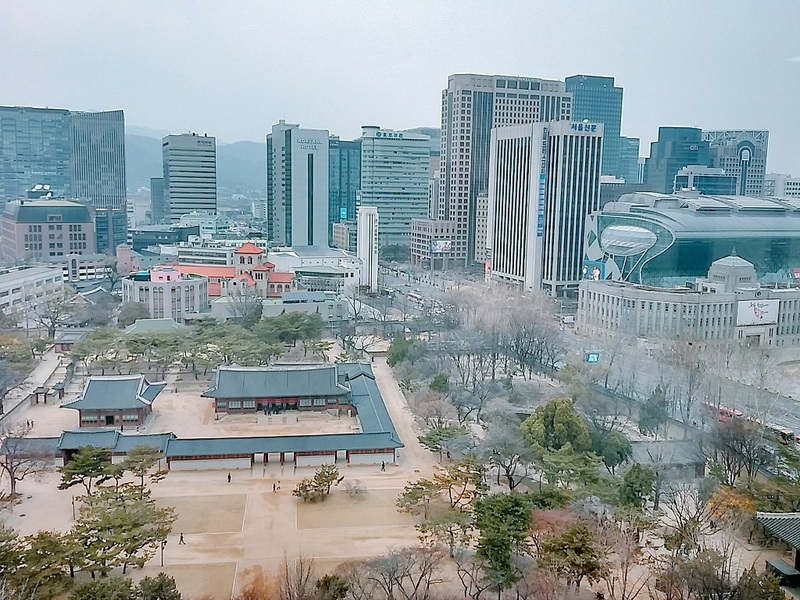 You will experience a Korean Royal Palace, walk around the historic area and learn about the history, see the city from an observatory, enjoy some nice coffee and also have shopping time! 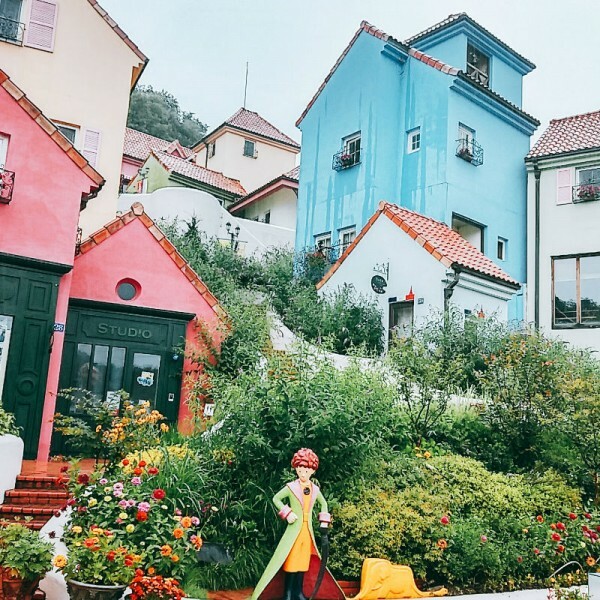 Hanbok is the traditional Korean costume and it really fits with the environment in with Hanok (traditional Korean architectures) and you can take amazing photos! make sure if you’re a male wear a man’s hanbok and female wear woman’s hanbok. The reason is because wearing hanbok to the palace is considered to be sacred and traditional practice in Korea so they hope you respect the genders to grant you free entrance! Book here for HANBOK – We recommend this hanbok shop as they have more than 600 styles for hanbok and make your hair look fabulous!! Now we are going to Deokugung ! 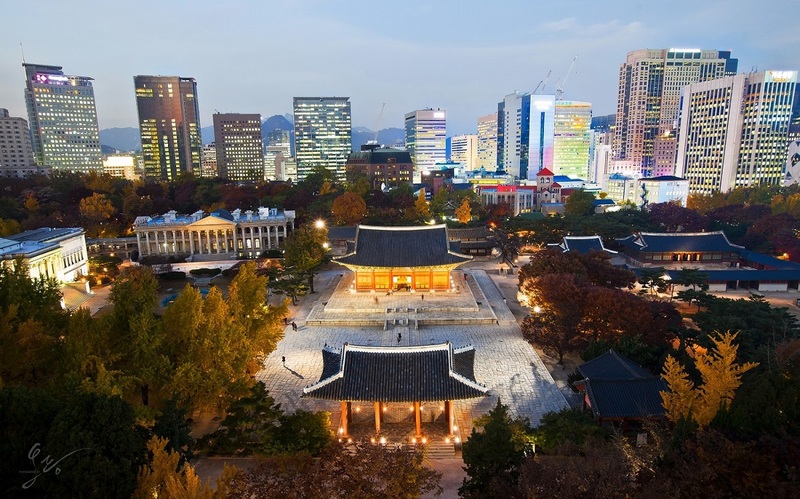 There are several palaces in Seoul but we recommend Deoksugung palace and Jeongdong road this time. Located at the corner of the busiest intersection of downtown Seoul near City hall, Deoksugung Palace is famous for its elegant stone-wall road(덕수궁 돌담길) . It is the only one Palace that has western buildings beside it, and it adds to the uniqueness of the scenery. 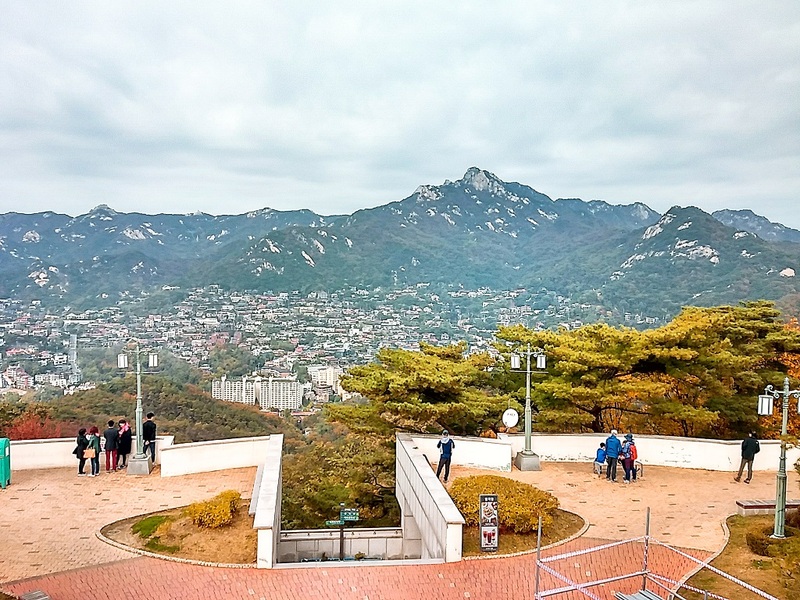 in the spring days of march, walk around this area and you will see the beautiful scenery of Deoksugung, Inwanasn, Bugaksan, Gwanghamun birds eye view. What to do at Deoksugung? – Highly recommended event for tourists. 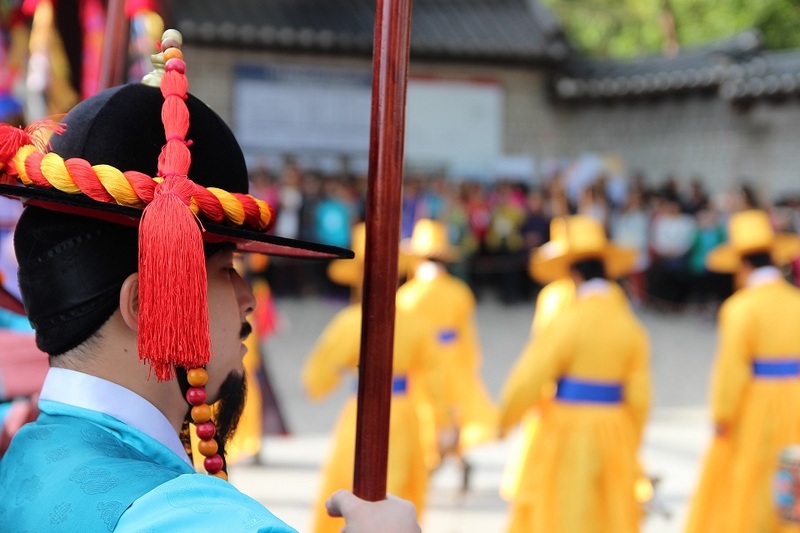 It is free and held three times a day in front of Daehanmun Gate at Deoksugung Palace. As each ceremony follows the same procedure and lasts for 40 minutes, visitors can choose whichever time is most convenient. It is a great opportunity to experience a rare traditional scene. You will the guards’ splendid costumes, with their brilliant primary colors, are a pleasure to view. While you cannot take pictures with the guards during the changing of guards, you can take a background picture of the guards and palace. – You can also take photographs with the gatekeepers after the ceremony is over. 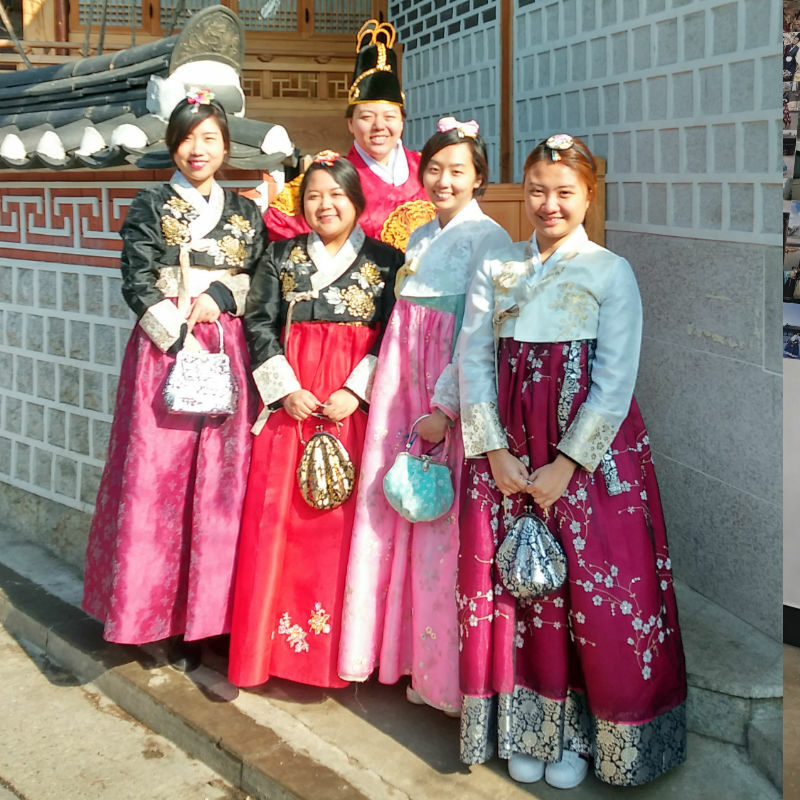 Visit the palace and enjoy the beauty of Korean palaces following the ceremony. So make sure to bring a camera!! Famous for the cherry blossom lane Deoksugung Palace Stone-wall Road reaches Jeondong area from the palace. There are over 20 benches and 130 trees along the road offering great places to rest and enjoy the unique atmosphere. BUT! you SHOULD NOT come with your lover ! Why? well it’s an urban myth that couples who walk the Deoksugung Stonewall walkway cannot escape the fate of breakup! It is said that the road is cursed and many Korean people believe it because actually there used to be the law courts for divorce in the area and you must follow this road to reach the court. So many couples who were getting divorced walked on this street! The road is quite famous that’s why lots of Kpop songs use it as a subject. One of the artists that you might know is Girls’ Generation Yoona. 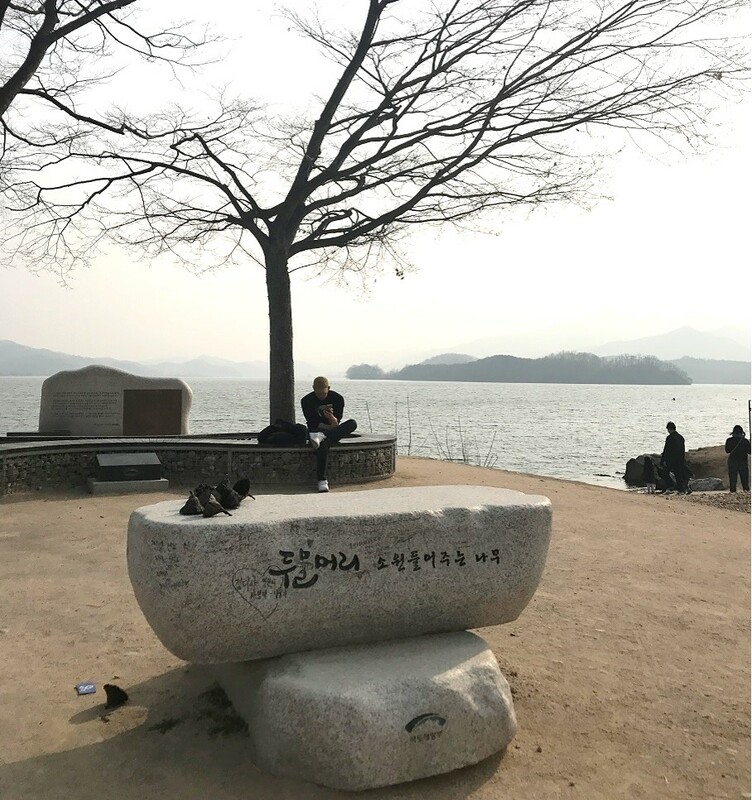 Her solo song 덕수궁 돌담길의 봄 (Deoksugung Stonewall Walkway) exactly talks about the SPRING TIME at the stonewall and the story that the couple is together and won’t break up! The Palace was famous for the King Gojung who was Korea’s second last King. he stayed there as his main palace and he loved westernization. In the palace you can see the Korean architecture but also a few western buildings. Learn about the stories behind the palace from the palace’s professional tour guide ! This is one of the highlights that many may not know , even for the Koreans! 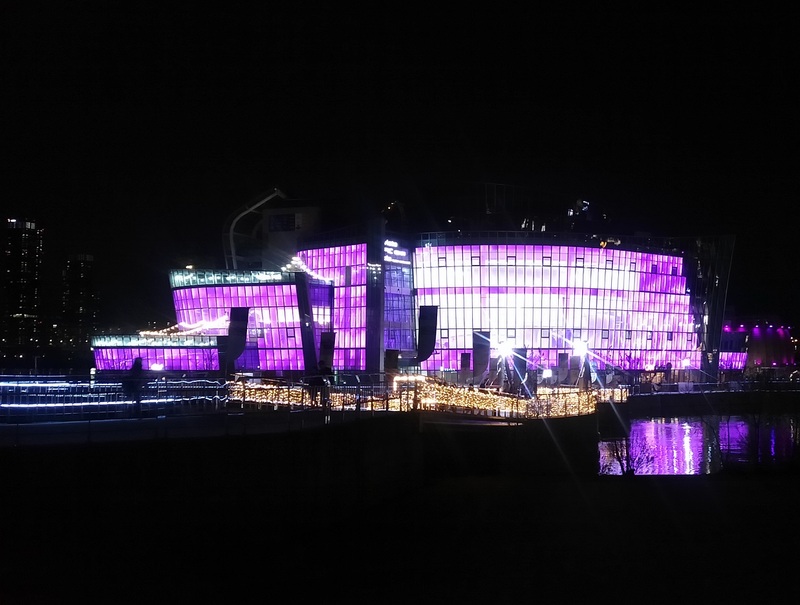 From the front door, Daehanmun of Deoksugung, walk 10m left to Jeondong road, there is also the Jeongdong Observatory , Annex Building of Seoul City Hall, where you can go the 13th floor to view the panoramic aerial view of Seoul and the Deoksugung Palace . See the photo we took when we went! When you arrive you will see a lot of informative wall drawings of the Jeondong area, history of Deoksugung and most of all a panoramic view looking over the Deoksugung Palace and the city hall area. What’s Best of all? it is FREE ENTRANCE! It even has a coffee shop which is very reasonably priced and serves great coffee! Definitely a great place to rest after the walking tour at the palace! So if you are coming to Seoul for a few days and are interested in going to the places above , the best way is to hire your own in Seoul city!